We've decided to start a Community Garden. 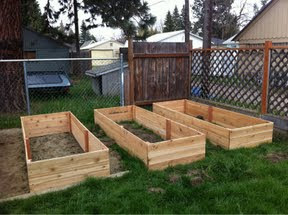 My husband and a friend have been building raised beds in the back yard of our ministry house. One more to go, then the dirt, then the plants. Friends are donating plants, everything from tomatoes, melons, peppers. I can't wait to watch it grow and to share the harvest with those we love. This is our summer project, and hopefully, everyone will enjoy the fellowship of planting, growing, and harvesting together. It just reminds me of when I was a child and I'd go to my grandparents house in the summer. My grandpa had a very large garden in his back yard and he loved to work in it. The tomatoes were the best, and I could go out and pick one anytime I wanted to and eat it right off the vine. My grandma canned the tomatoes, beans, beets, and the fruit from their trees. I want to do that too. God has blessed us with the means to build a garden, He will make it grow through our hands. I'm praying for an abundance of fruit in my life as well. I want to harvest blessings along with our garden. I read in Isaiah this morning, chapters 40 and 41. In 40, verse 11 it reads "He will feed His flock like a shepherd. He will carry the lambs in his arms, holding them close to his heart. He will gently lead the mother sheep with their young." Yes, He will continue to feed me and He will lead me. I will not fall under the enemies attacks, because my Shepherd is holding me in His arms! Say That Again, Dear Shepherd, You are feeding me, holding me, and leading me! THat is soooo awesome! I tried having a garden, but I don't have time to take care of it! i pray that your garden feeds your bodies as well as your souls!